Absolutely beautiful - my mother loved them. This is the second time I?? 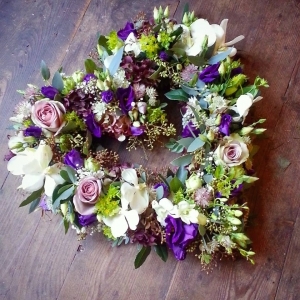 ?ve used this florists and have been really delighted both times. ???? 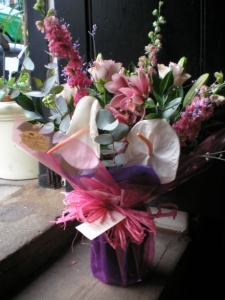 Flowers were as described and in good condition and delivered on time. The floral arrangements was beautiful and delivered in remarkable time. Thank you Pick-a-Lily!! A happy girlfriend, thank you for some great flowers!! I assume the flowers were enjoyed by the person to whom they were sent. Used this florist after receiving some flowers myself and was delighted with the seasonal jars. Did the same for a friend and was not disappointed. Gorgeous flowers - my friend sent a picture! Flowers lasted all over Christmas, my parents were absolutely thrilled with them, beautiful flowers and even the message card was lovely, will be buying flowers from Pick-a-Lily again. Beautiful arrangement that exceeded my expectation when I ordered them. Very happy and would highly recommend to anyone. Always deliver lovely flowers to my Mum! Flowers delivered promptly as promised. Am in Australia and will definitely use again for my relatives back home. Absolutely excellent, would recommend for all flowers and floral displays! Very pleased with the service and the flowers were gorgeous. Will use you again soon! 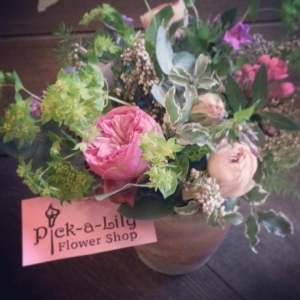 The arrangement was&quot;as advertised&quot; on Pick-a-Lily's flower shop website. The recipient sent me a photo and they look lovely. 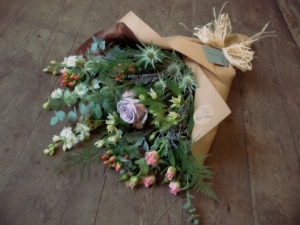 I am very happy and will use this shop for future floral delivery requirements from abroad. Delivery was prompt. <br/>Thank you! Stunning - so much better than bulk standard national florists. Fantastic. Best florists in the world!!! 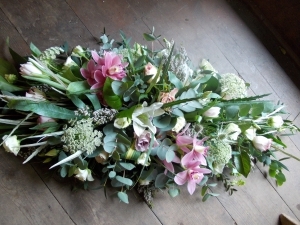 Beautiful rustic flowers..always happy with there designs. Fabulous!! The selection of flowers was excellent and presented beautifully. It was a generous bouquet of flowers as well. Beautiful flowers, mum was so happy! Excellent service again and will definitely be using Pick-a-lily again in the future! My friend was delighted with the flowers delivered. They arrived at the time requested and it was good to receive an email to confirm delivery. Service was spot on and the flowers were well received! mum said flowers were very pretty, haven't seen any pics yet though, so will confirm at a later date. 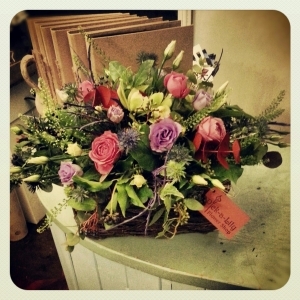 Nice to be able to order flowers in LA for delivery in Norwich! The flowers delivered matched the sample on the website; always a nice thing! Also: great to not have the sameness of FTD floral choices. Many thanks! 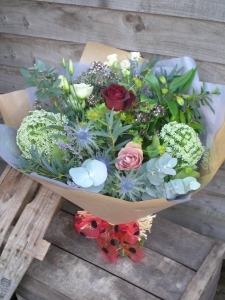 When ordering on line you can never really see what they are like, but this bunch was very reasonable and looked lovely as my friend sent me a photo, a very happy friend. 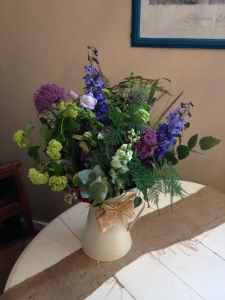 Prompt delivery - delivered next day after ordering outside business hours; beautiful flowers! 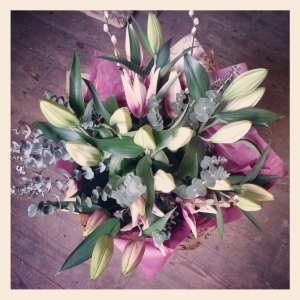 Beautiful flowers, arrived on time with a lovely hand-written card. Much better than other florists who typically just print out a message with little care for how it looks! Had flowers delivered myself from friends and they were gorgeous so decided to use Pick-a-Lily myself to order a 'thank-you' gift for a friend and they didn't disappoint. Wonderful service, arrived as stated and my sister was over the moon, beautifully presented and a stunning mix, thank you! Delivered as promised recipient was most pleased delivery staff friendly definitely use again. The flowers were well received. Please note commments above. Fantastic shop, really, really happy with the arrangement! I spoke to them regarding the order and they were fantastic. I haven't seen the flowers but the recipient was pleased with it. 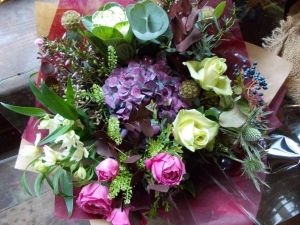 Very pretty and full bouquet, delivered on time. Well worth the price. Very good service, recipient delighted with flower arrangement. The recipient of the flowers said they were absolutely beautiful. A very cheering arrangement for her in a difficult time. 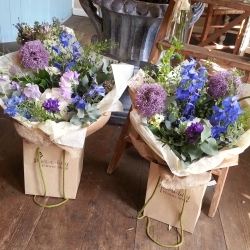 Lovely flowers just arrived. A bunch of lilies with mixed red and green foliage. The lilies are still in tight bud so should last a long time. Beautiful flowers and presentation. Delivery arrived on schedule. Highly recommended. 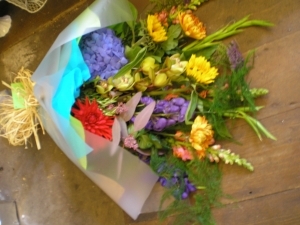 Easy, online ordering and a lovely bouquet was delivered at the time requested... I don't know Pick-a-Lily personally but would have no hesitation in using them again. Thank you my mum loves the basket of flowers! Quick, efficient service, thank you ! I ordered the flowers for my mothers 85th birthday and asked that some Chrysanthemums be included as they are her favourite flower. 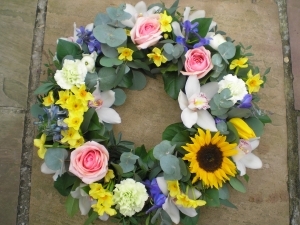 My mother is a keen gardener and she was delighted at quality and variety of flowers included. As requested, the Chrysanthemums were included, which Mum immediately noticed. She also loved the card that was included which listed the names of the flowers included in the bouquet as she had never seen this done before. Thank you very much for making this a lovely present. I have absolutely no hesitation is using your services again. Thank you. The gift was greatly appreciated and was outstanding in its beauty. Nice name for your shop, by the way! Excellent quality and good service. Thank you! Delivery was on time as requested and I received prompt email notification of delivery. Very pleased with service and quality of flowers. Thanks. 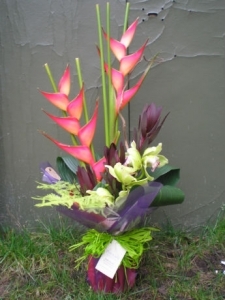 I live in Australia, and ordered flowers thru you, for a funeral. I loved that they looked so different from others I had seen, obviously it's a gamble when you can't select them yourself, but I have spoken to my friends in the U.K. today, and they said they were absolutely beautiful, So thank you so much! Easy to order, easy to pay "you get what you see." A Selection of mixed bright flowers. Wrapped with gorgeous paper and tissue. 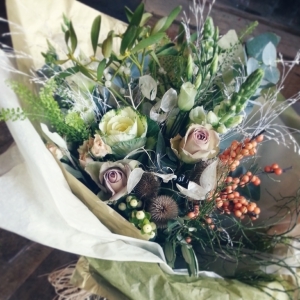 A selection of beautiful winter tones, gift wrapped in natural paper and luxury tissue paper. A natural design nestled in an old Belgian terracotta pot. Beautiful! 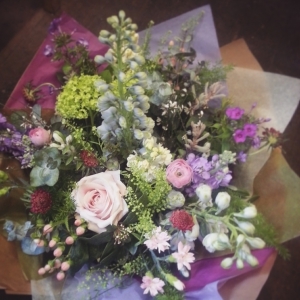 A Handtied Bouquet with a selection of feminine coloured blooms. 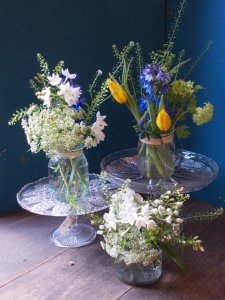 A beautiful array of country cottage flowers lovingly displayed in Jug. 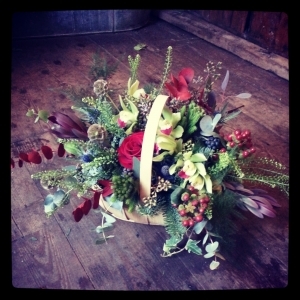 Rustic Selection of seasonal blooms and foliage displayed in natural basket. 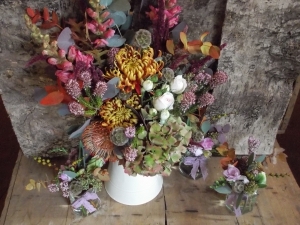 A lovely mixture of seasonal flowers, using textured foliage. In a complementary vase. 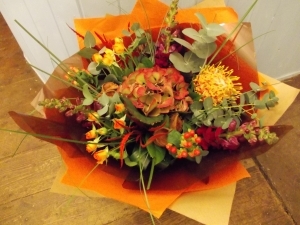 A Rustic Basket of mixed coloured blooms. 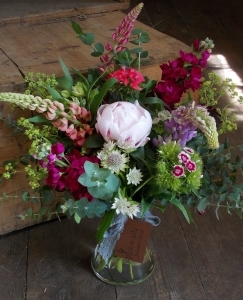 A Pretty Selection of English Country Garden Flowers and Foliage in a Vase. Finished with a lace bow. 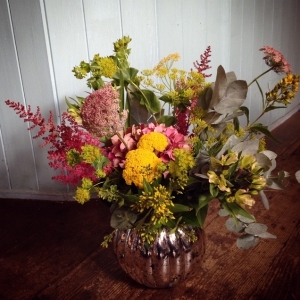 3 jam jars full of seasonal flowers and foliage. Colours may vary from photo. 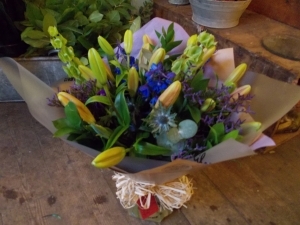 A mixture of Lilies and other seasonal flowers. 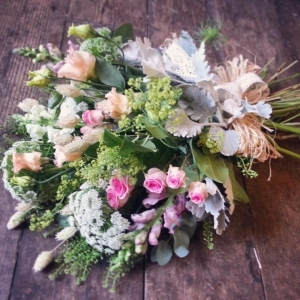 A beautiful mix of vintage flowers and foliages, giftwrapped and delivered in water. 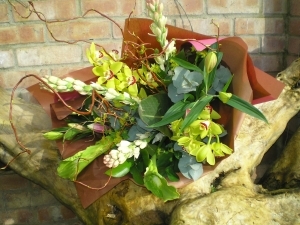 A tied bunch of Oriental Lilies and luxury foliage. 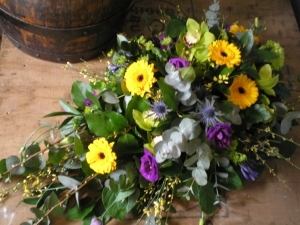 A beautiful mixed tied bouquet which is presented as a flat backed display. 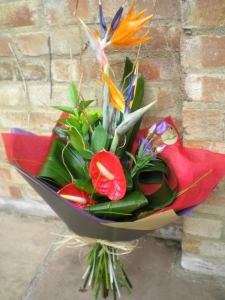 A tied bunch of various tropical blooms suitable to be placed straight into a vase. A limited vase design of tropical varieties with structured contemporary foliages. 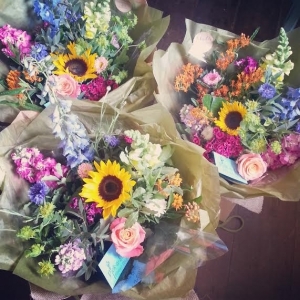 A stunning tied bunch of mixed blooms including some more exotic varieties. 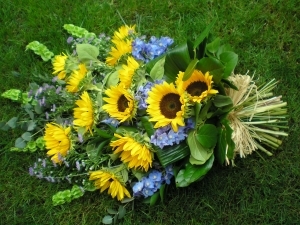 A beautiful tied sheaf of sunflowers and foliage. Please note only order when seasonally available June - september. 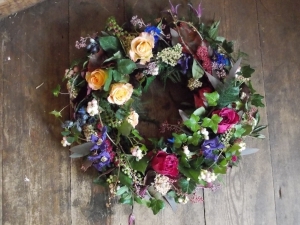 Natural Wreath, using dusky tones. 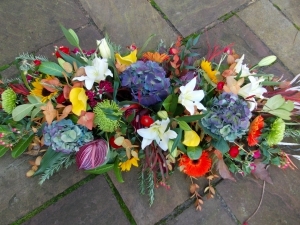 A 'Full' Heart with a mixture of seasonal flowers and foliage. 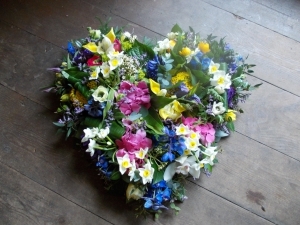 An 'Open' heart using beautiful garden type flowers and foliage.